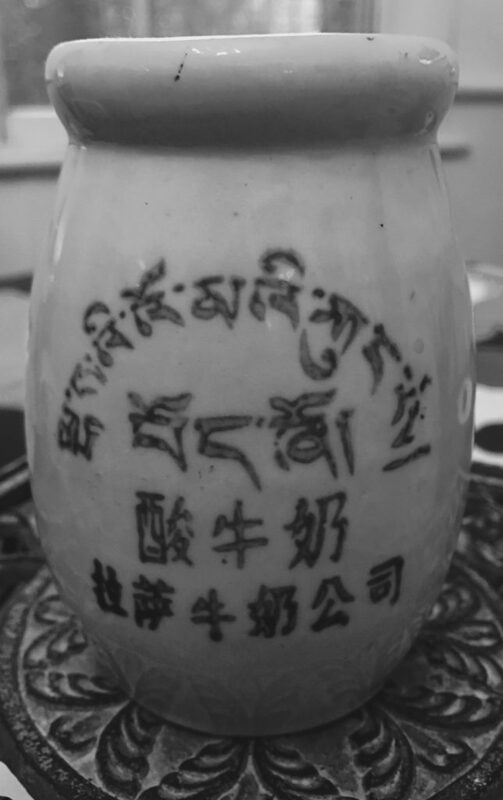 Tibetan yoghurt བོད་ཞོ་ jar, 1986. Editor’s collection. Zho ston ཞོ་སྟོན་, pronounced ‘shodun’, is a festival celebrated from the end of the sixth and during the seventh month of the Tibetan calendar (August). Monks of the Gelug School དགེ་ལུགས་པ་, the most famous of which is the Dalai Lama in Lhasa, were restricted to their monasteries during the previous month, supposedly to spare the lives of insects at the height of summer and, when the interdiction on movement was lifted, they would be greeted by lay people with gifts of yoghurt (zho ston means ‘yoghurt feast’). The festivities also feature the ‘sunning of Buddha’ tapestries, theatrical performances (a lce lha mo) and picnics at various public parks including Norbu Linka, formerly the summer residence of the Dalai Lamas. In 1986, I visited Lhasa with Linda Jaivin at the time of Shodun, the celebration of which had only recently been allowed once more by the Chinese authorities. Again, in 2005, I was with the photographer Lois Conner during Shodun. Below we present a selection of Lois’s work from that time, and from other trips Lois has made to Tibet. We gratefully acknowledge the support of Paula Vanzo of the Trace Foundation during our 2005 travels in Tibet and Qinghai. Sera སེ་ར།: ‘Wild Roses’ Gelugpa monastery college, just north of Lhasa. 顛倒 Downside Up — the art of Lois Conner. Jokhang. Photograph by Lois Conner. Barkhor Square. Photograph by Lois Conner. Drepung. Photograph by Lois Conner. Sera. Photograph by Lois Conner. Lukhang. Photograph by Lois Conner. Norbu Linka. Photograph by Lois Conner. Ganden. Photograph by Lois Conner. On the way to Samye. Photograph by Lois Conner. Samye. Photograph by Lois Conner. Potala. Photograph by Lois Conner. Lhasa. Photograph by Lois Conner.